Orthodox Churches research papers discuss the origin of the the Orthodox Churches and look into the groups that label themselves as Orthodox Christians. Orthodox churches research papers discuss the two branches of Christianity. Since the religion topic of orthodox churches is so large, you can specify a more narrow topic to write a religion research paper on. Paper Masters can help you narrow your religion topic or you can tell our writers which aspect of orthodox churches you would like us to write a research paper on. These groups split apart in the 5th century CE. 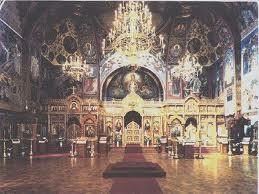 The Eastern Orthodox Church is the second largest Christian church in the world, second only to Roman Catholicism. It is the primary religion across much of Eastern Europe, Russia, and the Middle East. The Eastern Orthodox Church claims it is the One, Holy, Catholic and Apostolic Church directly descended from Jesus Christ, through the Byzantine Empire. The Eastern Orthodox Church spilt with its western cousin, the Roman Catholic Church in 1054 CE, an event known as the East-West Schism. The Oriental Orthodox Church had already split from the rest of Christianity following the Council of Chalcedon in 451 CE. Each of these churches is hierarchically independent of each other. These churches are each headed by a Patriarch, although the Coptic Pope is considered to be “first among equals.” Oriental Orthodoxy is the dominant in Armenia, Ethiopia, and is a minority religion in Egypt, Sudan, Lebanon and Kerala, India. World Council of Churches research papers on the ecumenical group, founded in 1948, which includes many mainstream Christian denominations with the exception of the Roman Catholic Church. Order a research paper on World Council of Churches from Paper Masters. Paper Masters writes custom research papers on Orthodox Churches and discuss the origin of the the Orthodox Churches and look into the groups that label themselves as Orthodox Christians.